Global Repair offers an easy process to inoculate your compost. New Compost windrows can be inoculated with our inoculating water wagon. Use finished compost that has been tested properly for beneficial microbial content. 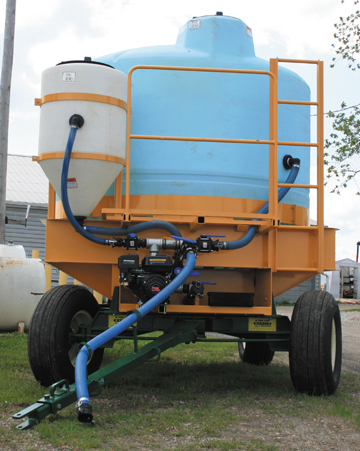 Compost tea and extracts can be made directly in our Inoculating Water Wagon tank. The compost can be placed in a mesh bag and gently massaged after dunking it into the inoculating tank or can be activated with a pump, releasing nutrients and microbes. The aeration water extraction invigorates microbes stimulating growth activity and reproduction. The Advanced Biological Compost inoculation process is formulated to use with and compliments the aeration action of the Sittler windrow turner providing even trace mineral distribution throughout the compost. CRF Compost Rock Flour TM (granular powder) can be added to the compost extract, added directly to the windrow or added to N source ingredients (manure, vegetable waste etc) during storage to reduce odours. Helps stabilize and bond ammonia and other gases, provides beneficial microbes and trace elements. When adding CRF (Compost Rock Flour TM) directly to the windrow; once the windrow has been formed, the CRF is added on top of the windrow with a loader or shovel at a rate of 1 to 3%, approximately 1/2 KG per cu yd of compost material. For smelly storage areas where odour is an issue CRF may also be added at 1 KG per cu yd of compost material.